say a little about what a seed is at its essence? seed is the embodiment of culture because culture shaped the seed with careful selection—women picked the best, diversified. So from one grass you get 200,000 rices. our oneness with the web of life, with the universe itself. and they can harvest a seed from it. are not identical to me, because each of us has evolved in freedom. The self-organizing capacity of life is expressed in diversity. Diversity of culture, diversity of humans, diversity of seeds. uniformity and external control and concentration go hand in hand. power of Monsanto and the like? supply. They will not stand a single seed that grows on its own terms. talked. How do you get energized and keep your own spirits up? movements, the number of protests taking place, and the number of people building alternatives, it’s huge. work of seed saving, promoting a peaceful agriculture, working with farmers, and now increasingly working with non-farmers. In the course we are running on the farm right now, we have 55 young people—someone from a banking system, someone from a software firm, three filmmakers. 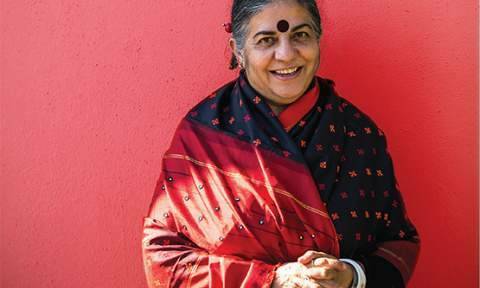 Sarah van Gelder interviewed Vandana Shiva for How To Eat Like Our Lives Depend On It, the Winter 2014 issue of YES! Magazine. Sarah is executive editor of YES! This article was published at NationofChange at: http://www.nationofchange.org/vandana-shiva-resisting-gmos-saving-seeds-political-act-1384786994. All rights are reserved.